You may want to know what kind of soil is best for growing plants in summer, fall, winter and spring. Soil types and their characteristics along with a step-by-step procedure for preparing garden soil for planting vegetables, fruits and flowers are described below. The success of any garden depends on the correct preparation of the soil. If soil is not proper, then your whole efforts for growing vegetables, fruits or flowers will go waste and you will be highly disappointed; and you may lose interest in gardening for ever. Preparing garden soil for vegetable garden or for any plant including fruits, herbs and lowers is easy if you understand different types of soils and their characteristics and uses. My many friends in Australia and elsewhere tell me that their plants are not doing well. They just buy seedlings and plant them without preparing the soil. The biggest mistake is that they use soil that is too-thin or too hard without any nutrients. They don't know that there are different types of soil for plant growth and which is the best for a particular plant. Their soil needs to be fixed and restored. Note that good soil preparation is the key to success! Here is a guide on how to prepare the garden soil for planting to have a great and delicious harvest of vegetables, herbs and fruits in winter, summer, spring and fall. Dig the ground to loosen the soil. If you are planning to grow root crops like potatoes, radishes or carrots dig to a depth of a foot or more for their roots to grow in. Other plants can grow in 8 inches of good ground. Remove any pebbles, weeds, roots, etc.from the soil. Break any big chunk of soil to loosen it well. Pour some water on the soil. If the water runs straight off or is very slow to soak in, it is likely water repellent. If your soil is water repellent, you need to add some water crystals to help water absorbency. Depending on the type of your soil, improve its quality. You can send a sample of your garden soil to a soil-testing lab for nutrient and pH analysis. If the soil is acidic, add limestone and if alkaline add sulfur to amend its property. An organically rich soil is essential for the growth of healthy and long roots that can take more nutrients and water. Irrespective of the type of your soil, add lots and lots of organic matter into it. I add compost, aged cow manure, shredded leaves and lawn clippings very liberally. Mix well. I make my own compost in a compost bin using the garden waste and vegetable and fruits peeling from kitchen. Allow the prepared soil to sit for a couple of days before planting. 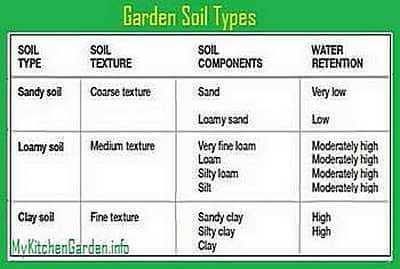 Garden soils are of different types having different characteristics and composition. Broadly there are three types of soil: sandy, clay and loam. The color, texture, structure and porosity of the soil depend on the proportions of organic matter, mineral particles, water and air contained in the soil. Sandy soil is high in sand, clay soil is high in clay. The loam soil is a balanced mixture of clay, sand and silt. The figure shows the characteristics of garden soils. The main characteristics of sandy soil is that water drains quickly through it, so quickly that it passes through before roots can absorb it. The draining water through the soil takes away nutrients from the plant’s root structure. Sandy soil is the least desirable soil type for fruit and vegetable gardening as it is highly water repellent. Sandy soils are in general more acidic than other types of soils, due to the absence of base salts in the sand. Sandy soil can be permanently improved quite easily by adding organic material into it. The loam soil is made up of a mixture of sand (40%), silt (40%) and clay (20%). The sandy loam soil is made up of sand and silt and clay in different ratios. Add compost (make compost at home) to the soil. Sandy loam soil is the best for growing tomatoes. The clay soil is though comprised of lots of nutrients and minerals and other fine soil particles, but the it is very dense and extremely sticky when wet because there is little air space between the soil particles. The clay soil can be improved by digging some gypsum into the soil. The clay soil will naturally break the clay over time. You may need to apply 2-3 times spread over 2-3 weeks. Once the clay is workable, add plenty of organic matter. It should be now clear that the soil texture can be improved by mixing sand, sawdust, compost, peat moss, etc. into it. The deficiency of magnesium in the soil can be corrected by adding Epsom salt (magnesium sulfate) in the soil.